How to access the H264 stream from webcams that feature H264 hardware encoders? 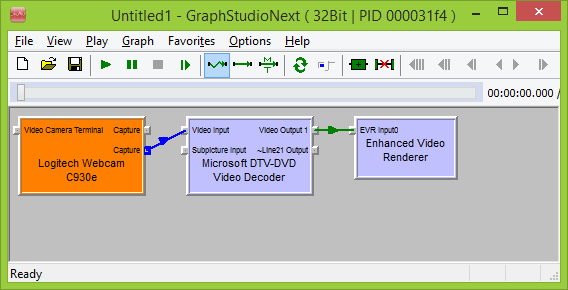 I'm developing a video capture application using DirectShow and I'd like to take advantage of the H264 hardware encoders present on some web-cams. In particular I'm looking at two cameras: the Creative Connect HD VF0750 and the Logitech C920 which both claim to feature H264 hardware encoders. Using GraphEdit, so far I've had mixed results. The Logitech C920 camera exposes an H264 stream as a Pin on the DirectShow WDM Capture filter but only on Windows 7. Trying the same on Windows 8 only shows output Pins for MJPEG and uncompressed YUV streams. On the other hand, the Creative Connect HD VF0750 camera does not appear to expose an H264 Pin at all - even in Windows 7. Yet, they both claim H264 encoders, and they claim that Skype can take advantage of the hardware encoders. So the question is - what interface or API does Skype use to obtain the hardware encoded H264 stream from these cameras? Since they're offered by different manufacturers it stands to reason that they use some common API and not just some obscure made-for-Skype custom interface. On Windows 8, the output is different. Neither of them come up with H264 sub-types (despite both claiming to support H264 hardware-encoded stream). At least in Win7 the Logitech camera provides the H264 pin as expected. Over time I received a few submissions from users for video capture capabilities of Logitech HD Pro Webcam C920 camera in different systems. The data is here. Availability of hardware H.264 video requires specific (most recent?) version of driver, and behavior is different across operating system versions. While in Windows 7 H264 media type is available on the capture pin the usual way, in newer OSes there is a separate additional Capture pin with H264 media types. Apparently, applications capturing H.264 are assumed to be aware of this new layout and connect pins/capture appropriately. The same applies to Logitech Webcam C930e camera (Windows 7 - no H.264 at all, Windows 8.1 - H.264 on second capture pin). Not the answer you're looking for? Browse other questions tagged encoding directshow video-capture h.264 or ask your own question. Is decoder automaticly added between two filter?